So she knows she wants to rock vibrant color in the warmer months, but she can’t choose between a dreamy peach hue or an on-trend shade of pink. 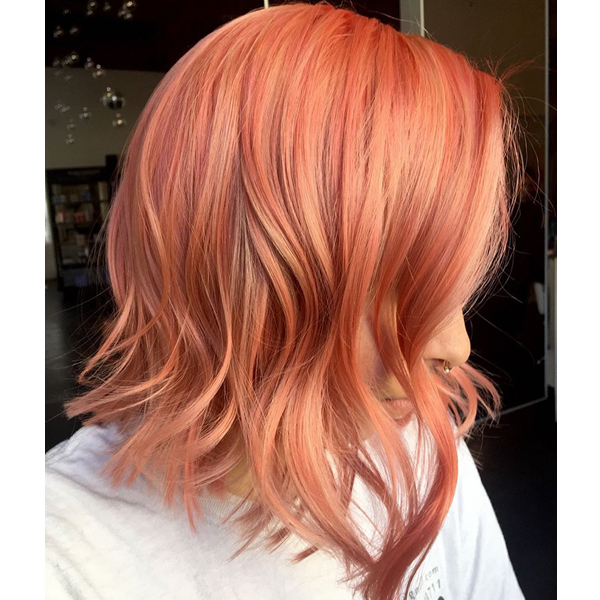 Why not give her the best of both worlds like Kori Temkin (@korimtemkin) did when she created this ultimate rosy peach? Find out how the New Mexico-based colorist did it in the color formulas and how-to steps below! 1. Start by sectioning the hair into quadrants and apply Formula A to the back two sections. 2. Then, move to the front sections and switch to Formula B. “I slightly bump up my developer halfway through the lightening process to ensure an even lift,” shares Kori. 3. Process for 30 minutes, or until the hair lifts to the palest blonde. Then, rinse and shampoo the hair. 4. Tone with Formula C by applying it to the roots first and then emulsify the rest of the formula through the ends. Process for 10 minutes. 5. Rinse, then blow-dry until her hair is completely dry. Then, apply Formula D throughout the entire head. 6. Process uncovered for 20 minutes, then rinse and condition with cool water. Then blow-dry and style as desired!